The Pet Project’s founder is an artist, filmmaker, writer and curator. His first passion however was for music; a love that is requited on a daily basis. In a career spanning almost three decades, Matt has directed a number of films featuring animals. Creating lyrics and music inspired by pets – and their owners – is the natural evolution. 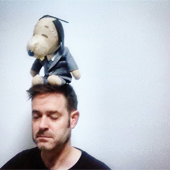 Lyrically Matt draws inspiration from Ivor Cutler, James Thurber, William McGonagall, John Shuttleworth, Stevie Smith, Spike Milligan, Billy Childish, John Cooper Clarke and Pam Ayres. Musically he’s self-taught, wilfully eclectic and bears without shame the influence of Bowie, Ian Dury, David Byrne, Arthur Lee, Sleaford Mods, John Otway, Wire, Lou Reed / John Cale and Robyn Hitchcock. The project’s charitable dimension is in keeping with previous creative ventures such as feature films Follow The Master and Dummy Jim that raised cash for Dogs Trust, The National Deaf Children’s Society and RNLI. Matt lives in Beijing with rescue dog Baozi, rescue cat George and gal-to-the-rescue Vicky. 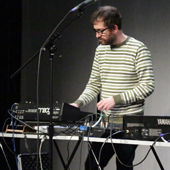 Jez is a Bristol-based composer and recording artist. He comes on board, when required, to add orchestration / embellishments to existing tracks, and create underscores to sit behind spoken-word pieces. Having played in a number of bands since the late ’80s, he now records and performs, with partner Polly, as The Twelve Hour Foundation. Although the pair are not permitted to keep traditional pets in their flat, they have managed to sneak in a variety of stick insects.